This is weird. Three nights ago I finished a post on Amanda Ripley’s book The Smartest Kids in the World: And How They Got That Way. I logged into my WordPress account a few minutes ago and it didn’t show up on my list of posts. I searched my list of drafts in case something went wrong when I clicked on the publish button, but it wasn’t there. I was getting anxious that the post was lost entirely, but then I spotted it, listed as a post from September 15, two weeks ago. I don’t know how that happened. In case you missed it, this post serves as a pointer. It’s here. 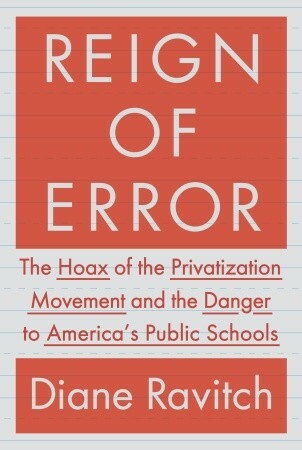 In addition to pointing, let me add some new content by noting the publication of Diane Ravitch’s book Reign of Error: The Hoax of the Privatization Movement and the Danger to America’s Public Schools, reviewed by Jonathan Kozol today in the Sunday NYT. Whenever I see a Ravitch piece in the New York Review of Books, I read it immediately. In the same spirit, I should download the book right now. However, I fear that I’ll find it to be an expanded version of the articles I’ve already read. Maybe I should read it after all.